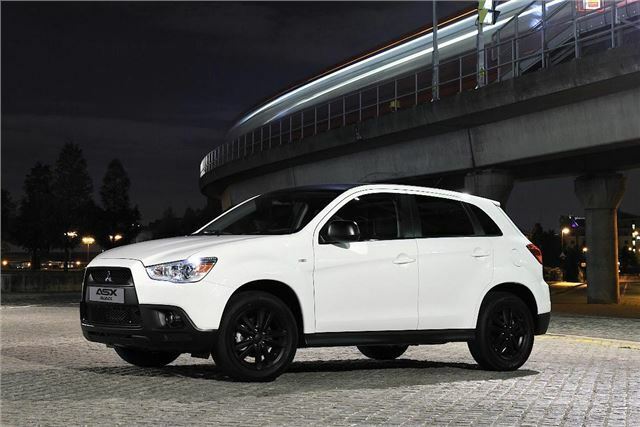 Mitsubishi has extended the ASX range with the addition of the Black special edition, which includes a satin black roof, satin black mirrors, grille and fog lamp bezels plus black 17 inch alloy wheels. The interior has been given the same treatment, with black leather and carbon fibre inserts. Prices start at £21,099. The Black is based on the ASX4 trim level, which comes with Kenwood sat nav, reversing camera, iPod connectivity and a selection of fuel saving features including a stop/start system. Two engines are offered – a 1.6-litre, 115bhp petrol and a 1.8-litre, 147bhp diesel. The petrol is only offered with front-wheel drive, but the diesel is offered with either front-wheel drive or all-wheel drive. The Black edition carries a premium of £1000 over the ASX4, meaning the 1.6-litre model costs £21,099, the front-wheel drive 1.8-litre diesel costs £23,299 and the all-wheel drive 1.8-litre diesel costs £25,399. The ASX Black is available to order now.